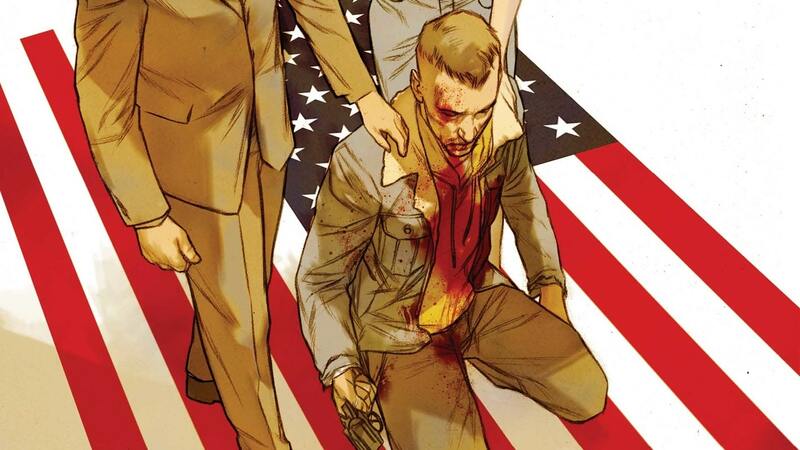 American Carnage #3 review: Action packed, tense, hard to read, and impossible to put down – AiPT! American Carnage has shown from the outset that it is unafraid to show the worst parts of the country. American Carnage from DC Vertigo comics has shown from the outset that it is unafraid to show the worst parts of the country. Dealing with racism head on is a difficult proposition, but American Carnage can be an especially uncomfortable read. Writer Bryan Hill tackles the racial divide without any filter leading to a confrontational story that draws the reader in even if they are afraid of what they are seeing. Issue #3 of American Carnage picks up right where the previous issue had ended. Richard has been placed in a very difficult situation in which there seems to be no way out. Unfortunately, if Richard does not comply with the white supremacist foot soldiers, his undercover persona will be blown. Even worse, he may end up a dead man. American Carnage #3 wastes no time making readers feel uncomfortable. At first, it seems like things will go the typical way things do for heroes in do or die situations. Even we do not know exactly how Richard will get out of the situation, we know he will. As soon as the reader gets comfortable, Hill takes the situation in an entirely different direction. American Carnage kicks into a gear that it never slows down from. The pacing of the third issue of American Carnage is high action and keeps readers on edge. The story stays at an uncomfortably high level that is tension filled the entire time. Hill’s writing makes the issue so suspenseful that it is simultaneously difficult to turn each page and impossible to not do so. Creating tension is difficult enough, but Hill manages to sustain it the whole issue. American Carnage tells the story in flashbacks that give more insight into Richard. Up to now, all that has been revealed about Richard is that he is a disgraced FBI agent due to an unfortunate incident that led to the death of a young man. Gaining more insight into the character was a good idea, since he was in danger of being one dimensional. The drawback is the information given only serves to make him seem like an even more infallible hero. Leonardo Fernandez’s art highlights the violence and tension of the issue. The majority of the issue is dark and panels are laid out in a cinematic style. Shadows are used to maximum effect. Even scenes in well lit rooms during the day see the faces of characters obscured in shadows. This only adds to the tension that fills the entirety of the issue. Despite the heavy shading, the characters are still very detailed. This is most obvious during the early part of the book. The first half of the book follows up with the cliffhanger from issue #2 and deals with its fallout. The detail in these scenes is incredibly important. These moments of American Carnage need a high level of detail since it deals with a myriad of emotions. Fear, desperation, anger, and confusion are expertly drawn by Fernandez during these pivotal moments. The art helps sustain the mood conveyed by the writing. American Carnage #3 is another great entry in the series. It continues the themes of uncertainty and anger that have been a part of the book since the beginning. The book’s initial mystery has become more of a set up to the character study the series is becoming. The question becomes, is American Carnage a study of its cast or of us? A tense and action packed issue that does not allow the reader to look away even though they may want to.